This is another delightful book in the Charlie and Lola series by Lauren Child. Most children will know the characters Charlie and Lola because of the TV series of the same name on Cbeebies, and the characters are just the same in this book. Charlie can always get Lola to do things though so he sets out to make the food more exciting. When Lola sees carrots and says she doesn’t like them, he tells her they are not carrots but orange twiglets from Jupiter! Suddenly they sound more appealing! Subsequently, the peas are moon drops from Greenland, the mashed potato is cloud fluff from Mount Fuji, and the fish fingers are ocean nibbles from the supermarket under the sea – and definitely a favourite with mermaids! In my opinion this is a delightful little story with good strong characters. Charlie is the narrator but most of the story is told through dialogue. This is quite a challenge for reading it to little ones if they know the TV series because the voices are quite distinctive. The story is accompanied by some very good pictures as well. There is a mixture of cartoon drawings and real photographs of some of the food which makes all the pages distinctive. The text is set out in an interesting way – sometimes curling and swirling all over the page, which would not be very suitable for beginner readers to attempt on their own. There are lots of different backgrounds throughout the book – for example on one page there are lots of peas in the background. I think all of these add to the overall effectiveness of the book. When my daughter was about three she started turning into a bit of a fussy eater herself so I wasn’t sure about the content of the book – did I really want to read her a story about an even greater fussy eater and add to her list of dislikes? As it happens, I think that this book slightly helped with her fussiness – at least when she was eating ‘orange twiglets from Jupiter’ or ‘cloud fluff from Mount Fuji’! I just needed to use my imagination to come up with some appealing ideas about broccoli, courgettes, peppers and mushrooms to name but a few! So overall I feel this is a very good book – both story and illustrations. The fact that my daughter already knew the characters through the TV series meant that I knew she was going to relate to them. Since reading this book, we have read and enjoyed many more Charlie and Lola books, and at the age of six, my eldest daughter still loves them. 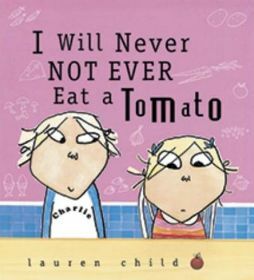 No Comments on "I Will Never Not Ever Eat a Tomato"